A toy soldier keeps watch by the window. 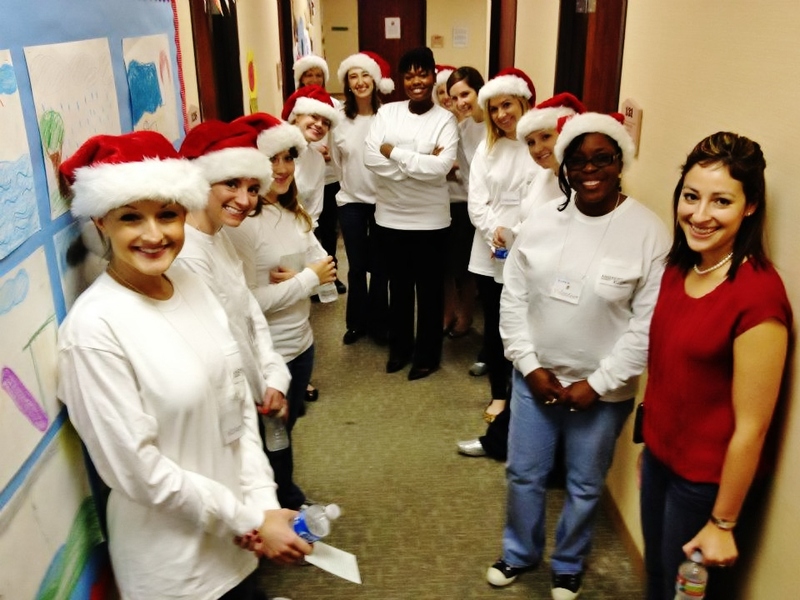 Houston Area Women's Center Holiday Store. I have written about The Houston Area Women's Center (HAWC) in the past (HAWC goes back to School), their mission to help "individuals affected by domestic and sexual violence in their efforts to move their lives forward", to "provide shelter, counseling, and advocacy to support them in building lives free from the effects of violence", and of how I came to be involved (thanks to my dear friend Laura's invitation) with this worthiest of causes. This time I want to tell you about an event in which I feel some of the innocence lost by the individuals HAWC serves is restored, even if just for an afternoon. On the second week of every December, the halls of HAWC are literally decked as handmade decorations and piles of presents adorn the corridors; over the course of the week volunteers and staff members sort and pack the new toys, housewares, cosmetics, books, clothes, and candy that have been donated by generous Houstonians, and that will fill the stockings of the hundreds of families served by HAWC. The presents are offered in a shopping setting (much like the Back to School Project) in which mothers choose gifts for each of their children and the children choose presents for their mothers. Houston is full of gift drives leading up to the holiday season, but I think HAWC's Store format (rather than gift distribution, or "family adoption") and emphasis on choice, does as much for the families' economy as it does for their dignity and self-esteem. On shopping day the mothers also choose one gift for themselves, and HAWC does a great job of making this particular selection as special as possible by emphasizing items of a personal character like cosmetics and accessories; these small luxuries give the mothers an opportunity to think, for one short moment, of no one but themselves, and to indulge in picking something not out of necessity, but out of sheer want. Small Luxuries. Houston Area Women's Center Holiday Store. 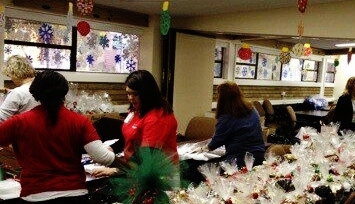 Organizing the Holiday Store requires physical and mental labor, from the planning sessions early in the year, the moving of boxes full of toys, the sorting and wrapping of presents, to the shopping days in which the volunteers help the families choose their gifts. This year, in the weeks leading up to the event, the staff and volunteers were busy creating gift baskets for the mothers and their teenage daughters. We filled the baskets for the mothers with coffee cups, packets of hot chocolate mix, coffee beans, tea towels, and various sweets. The baskets for the girls were filled with a great variety of cosmetics and personal use products. Making gift baskets. Houston Area Women's Center Holiday Store. Image by HAWC. Pam Hobbs, manager of Children's Court Services, prepares a gift table. On shopping days the presents are laid out in various rooms according to the age and gender of the children. In an effort not to spoil any surprises, friendly volunteers accompany mothers as they choose gifts for their children, who are in turn guided through a different route to choose gifts for their mothers. There is much excitement on that day, particularly for the little ones who not only get to choose the gifts but also wrap them and label them, making the experience joyful and personal. Santa's Helpers. Image by HAWC. There is need, injustice, and suffering around us, but we can help to eradicate them. I hope this post will inspire you to add volunteering and charity to your New Year's resolution list. Visit HAWC's Facebook page for volunteer information, and follow them on Twitter for news and updates. Many thanks to HAWC for letting me be a part of their mission, and allowing me to write this story. All images by Nadia Palacios Lauterbach unless otherwise noted. Good reminder to add giving time to a NY's resolution lists! I like the sound of this event, that there are the gifts and that the day sounds like a gift in itself; something fun to which attendees can look forward. And, as you mentioned, the format is dignifying. What a great thing to give time to, both in person and "in blog", Nadia! Thank you Jamie! This is an event that you would love to do and would be great at! I'll keep you posted about HAWC in the future!